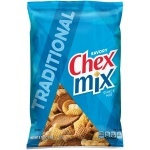 The original snack mix! 55% Less fat than regular potato chips. 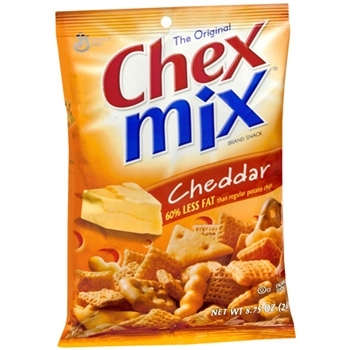 Loaded with fun flavorful shapes: Round pretzels Wheat chex Cheddar cheese crackers Corn chex Mini twist pretzels Cheddar Chex Mix - 4g fat per serving - has 55% less fat than regular potato chips - 10g fat per serving. Carbohydrate Choices: 1-1/2. Made in U.S.A. 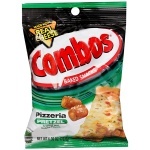 Whole Wheat, Enriched Corn Meal (degermed yellow corn meal, niacin, iron, thiamin mononitrate, riboflavin, folic acid), Vegetable Oil (soybean, rice bran), Sugar, Whey Powder. 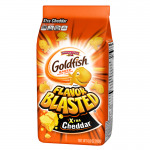 Contains 2% or less of: Buttermilk Powder, Corn Syrup Solids, Salt, Natural and Artificial Flavor, Dried Sour Cream (cream, nonfat milk, cultures), Monoglycerides, Onion Powder, Trisodium Phosphate, Calcium Carbonate, Baking Soda, Yellow Corn Flour, Yellow 6 Lake, Yellow 5 Lake, Freshness Preserved by BHT. Goes down well with an early evening lager!